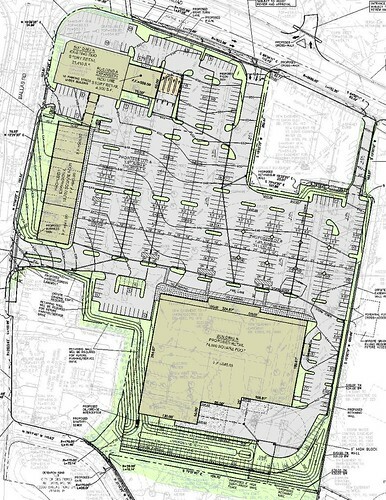 Des Peres Corners final site plan (cropped). // Des Peres, Missouri. This week, parts of the new Des Peres Corners commercial development, located at the southeast corner of Manchester and Ballas roads, began to open. Built and marketed by Summit Development, Des Peres Corners will be anchored by a Schnucks grocery store. Schnucks is moving from just down Manchester Rd claiming it’s current 5-times expanded 55,000 sq. ft. store is too small to meet its needs in the marketplace. A quick look around the site, however, reveals that no thought was given to accommodating pedestrians. The biggest pedestrian issue at Des Peres Corners, as far as this post is concerned, is the complete lack of an accessible route, both from within the development and without. From without, despite the presence of sidewalks around its periphery on both Manchester and Ballas roads, only a single sidewalk enters Des Peres Commons from the street. That sidewalk doesn’t have a curb ramp at its end nor does it connect to any of the storefronts within the site. This means that a pedestrian walking from the Ballas Pond subdivision just to the south would have to walk in the street within the site to get to the Schnucks store. Nor could a Manchester bus rider get to the soon to open Qdoba without cutting across 70-ft of grass and parking lot. From within, Des Peres Corners is composed of mulitple buildings: the Schnucks anchor store and various outparcels. As currently built, there is a lack of accessible routes from one parcel to the next. For example, it is not possible to travel on a sidewalk or in a crosswalk from Schnucks to any of the storefronts along Ballas Rd. What’s the point of having public sidewalks if you can’t use them to get to your final destination? What follows is a simple gallery showing just some of the many deficiencies Des Peres Corners has from a pedestrian point of view. Pictures were taken during a quick 10-min walk around the site. These pictures do not represent an exhaustive list of the pedestrian issues present at Des Peres Corners. Left: This sidewalk, coming from Ballas Rd, is the only one that enters the Des Peres Corners development from a public street. It ends as soon as it meets the parking lot without a curb ramp and without connecting to any of the storefronts. Right: A curb ramp on the west end of Schnucks. No connection exists between Schnucks and the storefronts in the background. Left: The sidewalk crosses a secondary entrance on Ballas Rd. No sidewalk connections exist to the property on the right. Right: A new sidewalk has been built along Manchester Rd. No connections exist to the storefronts on the left. Left: Looking towards Manchester Rd across the parking lot from the main entrance to Schnucks. Right: A look at the main entrance into Des Peres Corners from Manchester Rd. The sidewalk on Manchester Rd crosses this drive, but does not enter the development. No provisions have been made for adding a sidewalk in the future. Left: A look at a secondary exit drive to Manchester Rd. No sidewalks here. Right: Des Peres Corners has a fence all the way around to shield it from the nearby neighborhoods and commercial strips. No cross access provisions have been made to the adjacent commercial strips. Thanks to Steve Patterson of Urban Review STL for inspiring the title of this post. Readers of his blog may be familiar with his coverage of Loughborough Commons in south St. Louis city which had similar issues accommodating pedestrians from its inception. I don’t blame Summit Development, but rather the planner who reviewed this project. These errors are the typical stuff you address during site plan review with an applicant.